Perhaps one of the wisest voices in Calline Sanchez’s early life was a self-employed beautician – her grandmother. Sanchez also credits her professor father who, upon noticing she wasn’t reading books so much as memorizing pictures, bought a coding compiler when she was in elementary school. “He thought that was the only way he could teach me to read because it would give me sight words,” she said. The making of this STEM superstar was well underway. The eldest of seven, Sanchez went on to earn three college degrees – bachelor’s degrees in communication and information technology, and an MBA from the University of Arizona. At IBM, she is charged with meeting the enterprise storage needs of a demanding, data-intensive world. From her office at UA Tech Park at Rita Road, she manages IBM’s disk, flash and tape data storage technologies, leading a worldwide team of engineers and scientists in Tucson, Guadalajara, Tokyo and Shanghai. At IBM’s Armonk, New York, headquarters in 2008, she got the chance to work with Nicholas Donofrio, the executive VP of innovation and technology, reporting to then-IBM CEO Sam Palmisano. She helped with various technology, government and corporate projects that took her to more than 25 countries before coming to Tucson in 2009. In 2016, IBM secured 465 U.S. patents in the state of Arizona – 410 of which came from IBM Tucson. The company’s All-Flash DS8886 storage system was named a finalist for the “2017 Tech Innovator Award” by Computer Reseller News. She relishes the problem-solving and strategic facets of her work at IBM, saying that in college she once took a job at a law office that specialized in immigration and thoroughly enjoyed learning the ins and outs of the process. 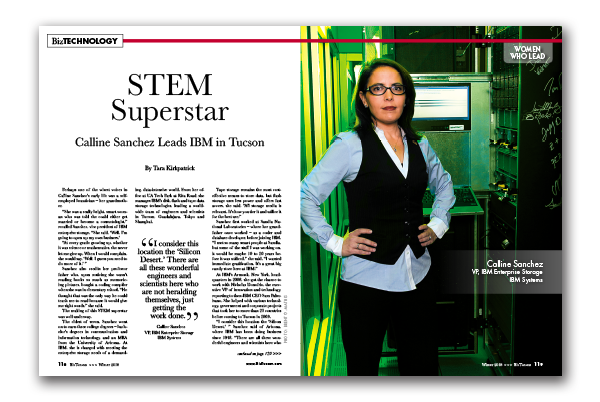 Now a mom herself, Sanchez has become a role model for young women in engineering and works to partner with local organizations, including the Southern Arizona Leadership Council, the Society of Hispanic Professional Engineers and the Southern Arizona Research, Science and Engineering Foundation. She noted that IBM Arizona employees and retirees pledged $514,000 to nonprofit organizations and the United Way in 2016. Her local involvement is noticed.